The soup's on in Halifax! 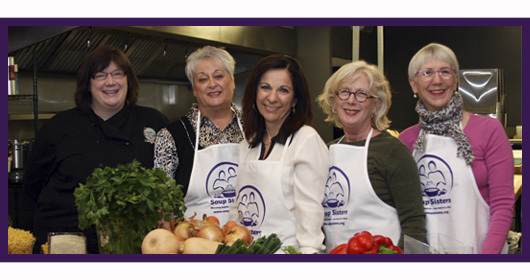 Soup Sisters Halifax launched February 4, 2014 with a wonderful group of 30 inaugural Halifax soup-makers who chopped and diced over 200 servings of nourishing soup for Bryony House. Prior to the mid seventies, no formal services for abused women and children existed in Halifax. A group of concerned women came together to explore the possibility of more formalized supports and services, resulting in a study on women leaving violence. The results of the study highlighted the extent of abuse in which women and children were living and recognized the lack of available resources in the community. The group formed the Halifax Transition House Association and opened Bryony House in 1978, the first transition house in Nova Scotia. As a non-profit organization, it provides 24 hour emergency services for women, with or without children, escaping intimate partner violence. Bryony House is a 24-bed shelter and continues to be the only transition house in the Halifax Regional Municipality, whose sole mandate is to help those affected by intimate partner violence. Kitchen Door Catering is the creation of Chef/Owner Patty Howard who studied at Johnson & Wales in Rhode Island and worked her way from Alaska to Chicago and Ottawa to Halifax. Kitchen Door Catering focuses on hand-crafted food, never processed, fresh & locally inspired. The open-style kitchen in Dartmouth Crossing showcases their professional kitchen and is a wonderful place to come together and enjoy delicious and nutritious chef crafted food. Soup Sisters is thrilled to have the opportunity to work in partnership with Kitchen Door Catering in support of Bryony House. Soup Sisters and Broth Brothers charge a $55 participation fee per person to cover the expenses of ingredients for the soups, the venue, equipment, supervision, and a Chef or professional facilitator. This ensures that the finest ingredients possible are used every time for the women's shelter. Events are social evenings with lively conversation, chopping, laughter and warm kitchen camaraderie that culminate in a simple, sit-down supper of soup, salad, bread and wine for all participants. 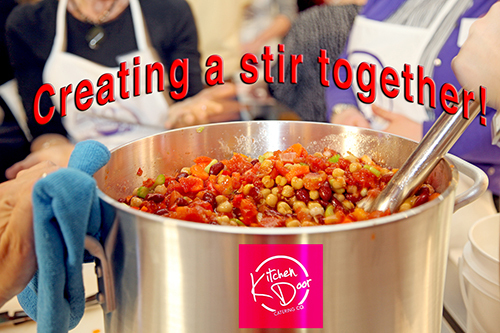 Each event produces approximately 150-250 servings of fresh soup that sustains your local shelter with nourishing and nurturing soup each month.